If you're new to the parenting world, it's essential that you possess the knowledge to differentiate between high-grade baby gear manufacturers and less than average ones. Gaining this retail skill opens up doors that makes it possible for even those on a strict budget to be able to cater to every single one of their baby's needs. All in one baby products prove to be more useful and sometimes of higher-quality, but that entirely depends on the manufacturer. Fortunately, Graco is a baby product company that's been around for over 60 years and is the type of manufacturer that you can place your trust in to provide safe as well as practical baby gear. Internationally known to ensure reliable parenting solutions, Graco has proudly served and helped over 1.5 million families and continues to do so today. After keeping up with technological advances, it’s no surprise that Graco holds numerous awards commending its effort to produce safe yet comfortable baby products. A Graco product that has evolved over the years and is considered to be the optimal all in one baby device is hands down Graco Pack 'n Play Playard Snuggle Suite LX Bassinet. 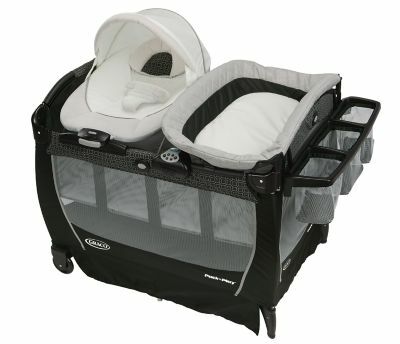 Keep reading for an in-depth review of Graco Pack 'n Play Playard Bassinet. If you are on a tight budget but don’t want your baby to suffer as a consequence, you should consider purchasing baby products that prioritize functionality in regards to design over any other feature. The affordable answer you’ve been searching for comes from the design labs at Graco and goes by the name of Graco Pack 'n Play Playard Snuggle Suite LX Bassinet. In regards to how Graco’s reputation rose within the baby product market, it was during the 1980’s when the brand released its signature device called the Swyngomatic, which was a hit and could be found in millions of homes throughout North America. Simply put, the Swyngomatic was a baby swing, which then evolved into the device we are reviewing here. In fact, the son of the Swyngomatic inventor is responsible for the creation of Graco’s well-known series of Pack N’ Play Portable Playards. Since there are four different nursing gears all lodged into one device, you end up spending significantly less money, which is extra cash you could use to buy other baby products. The four features that solidify the superiority Graco Pack 'n Play Playard Bassinet has over its competitors are the following: a changing station, full-sized bassinet, removable newborn station, and playard. As a side note, the entire Graco Playard Bassinet is portable, so you can easily transport from one room to the next if you need to have eyes on your baby at all times. When you combine the multi-functionality with the practicality that this product ensures, you’re left with a satisfied baby, which is the end goal of every mother. Buyers love how one simple product such as Graco Pack 'n Play Playard Bassinet comes in handy when you have to address a versatile amount of nursing issues, but you don't have the money to buy separate nursing gear that's meant to cater to a specific purpose. Mothers who want to foster a bond with their baby while nursing should realize that creating a positive environment for your baby is the easiest way to solidify such a relationship. This is when Graco Pack 'n Play Playard Bassinet comes into play since it allows your baby to associate a particular environment to one where it can both nap and play. As your baby becomes more familiar with its surroundings, you shouldn't be surprised to see your child look healthy and well-rested, which means fewer late night crying sessions you have to appease. This is good news for you since you can finally sleep for a whole eight-hour session rather than two-hour intervals at a time. Based on positive buyer reviews, Graco Pack 'n Play Playard Bassinet is the ultimate nursing gear option you can equip your household with since it's built to guarantee a comforting setting that your child will either play in or rest. Out of all the nursing gear features Graco Pack 'n Play Playard Snuggle Suite LX provides, the one parents preferred the most is hands down the best bassinet since it was softer and plusher in texture than any other bassinet available in the market. Out of all the online retailers that claim to sell Graco Pack 'n Play Playard Snuggle Suite LX Bassinet, the number one option amongst parents, without a doubt, is Amazon. In regards to deals and discounts, Amazon offers about a 30% discount off of the Graco Pack 'n Play Playard Snuggle Suite LX Bassinet original price, which will save you a significant amount of money in the long run. For under $160, you can listen to the advice of countless parents and do yourself as well as your baby a favor by purchasing Graco Pack 'n Play Playard Snuggle Suite LX Bassinet. This is a must-have product that every newborn should have available to them since Graco Pack 'n Play Playard Bassinet works not only to satisfy your baby but your mental health as well. You can say goodbye to the nights of your baby crying and waking you up at random times since the Graco Pack 'n Play Playard Bassinet will keep it occupied till it’s too tired to keep its eyes open. The innovative functionality associated to this bassinet is what ultimately sets it apart from its competition, so you can’t go wrong when you order Graco Pack 'n Play Playard Snuggle Suite LX. I would highly recommend buying Graco Pack 'n Play Playard Bassinet especially if you want to make the most out of what you’re paying.